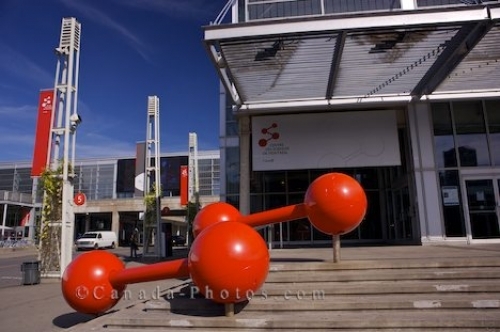 An adventure to the Montreal Science Centre in Old Montreal, Quebec is something that can be enjoyed by the entire family while learning a great deal about science and technology. This scientific exhibit on the staircase at the entrance to the city of Montreal Science Centre is the just the beginning into the world of science. Montreal Science Centre, Centre de Sciences de Montreal in Old Montreal, Old Port, King Edward Basin, Montreal, Quebec, Canada. Picture of the entranceway to the Montreal Science Centre in Old Montreal, Quebec where a unique exhibit brightens up the area.